We would like to remind viewers that Gotham contains adult content and viewer discretion is advised. Content/trigger warning for language, drugs, violence, death/murder, and relationship abuse. Gotham is back after being on hiatus for over a month, and your Gotham Girl is here to take you through the episode’s events! During a flashback, this week’s episode went a little 50 Shades of Grey. Young Grace Fairchild meets a wealthy and charming man looking for unconditional love. He takes her back to his place, which has a secret room filled with instruments of torture. But unlike Anastasia Steele, Grace Fairchild’s story ends in murder. Her “charming” new boyfriend quickly reveals himself to be a psychopath. He holds her captive in his home, forcing her to pretend to be his happy housewife. When she doesn’t act as happy and perfect as he had hoped, he ties her up, photographs her, and kills her. Who is this man? A new and original villain known as The Ogre. And last Monday’s episode was the first of a three-part series featuring him as the main baddie. 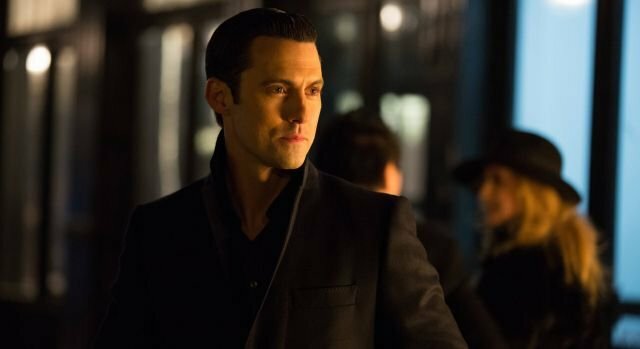 With him as the main villain until the season finale, we can be sure Grace Fairchild is only the first of his victims we’ll see on screen — his future targets being faces a bit more familiar to us. At the GCPD, Jim Gordon is approached by an officer who seems to be a big fan of his. He says he admires Jim for actually getting things done around there for once, and asks him to look into an old case that was never solved. Jim takes the file and reads it over with Lee Thompkins. The file contains all available info on the disappearance and murder of Grace Fairchild. The last time she had been heard from was when she called her mother to say she was having a drink at a bar in South Village. According to the file, police followed up on this, but no one working at the bars in that area remembered seeing her. Lee, who is originally from South Village, informs Jim that there are speakeasies there you can’t find unless you’re “in the know”, which the police might not have checked. Jim asks Eddie to research this, and also asks him to track down a piece of evidence that is now missing from the file. With much effort, Jim convinces the reluctant Harvey Bullock to help him unofficially investigate this case. With Eddie’s help, they discover the location of one of the speakeasies, where one of the employees remembers seeing Grace Fairchild with a date. Meanwhile, Lee looks over the victim’s body. She finds that, other than the fatal stab wounds to her heart and throat, Fairchild's body is in pristine condition — something not typical for people who have been held captive for months. Eddie finds the piece of missing evidence — or rather, a photo of the missing evidence. He gives Jim the photograph, which depicts a drawing of a broken heart, found at the crime scene. Harvey recognizes it as the calling card of a serial killer known as The Ogre, who preys on young women. No one bothers trying to catch The Ogre because anyone who investigates his killings has their loved ones targeted. Harvey asks how Jim was placed on this case in the first place, and Jim says a fellow officer asked him to look into it. After Jim points out the officer that gave him the file, Harvey threatens the guy until he talks. The officer admits he only pretended to admire Jim so that he would take the case, and that he did so under orders from Commissioner Loeb. Harvey tells Jim he still has time to drop the case, and warns him that continuing the investigation could put Lee in danger. But Jim insists that, now that he knows about the Ogre, not following through with it would make him partially responsible for any of the killer’s future victims. Still, he is furious that Loeb would take such actions. He finds the Commissioner, tells him that putting his loved ones in danger crossed the line; and threatens that, as soon as he’s done taking out the Ogre, he’s coming after him next. Oswald Cobblepot tries to convince Lydia, a bar owner as well as Gabe’s mother, to make him her silent partner. But no matter how much money he offers her, she doesn’t seem interested. Oswald asks if there is anything besides money she wants. Lydia tells him that her beloved and innocent granddaughter has been seduced by a young man — a guitar player Lydia does not approve of at all. If Oswald can find a way to break them up and bring her granddaughter back home, then she will reconsider his offer. Oswald and Gabe kidnap and torture the boyfriend, finally resorting to breaking off his fingers in order to get him to give up the girl. Once the heartbroken granddaughter returns home, Lydia finally makes Oswald her partner, just as he wanted. Since the bar is small and, as far as he can see, unimportant, Gabe asks Oswald why owning it is so important to him. Then, some photographs on the wall reveal it is a place Maroni frequents. On the Dollmaker’s island, Fish is attempting to formulate an escape plan. From the window she can see both a boat behind a locked gate, and a chopper. She steps outside, but a man known as the Catcher drives up and threatens to shoot her if she ever tries going outside again. Fish rounds up the toughest of the prisoners in the basement and asks if they want in on her escape plan. They wonder why she’s asking them and not her friends, such as Kelly (who is still recovering from having some of his parts taken). They agree to help her. She tells them that, although there is a chopper, none of them know how to fly, so they will have to use the boat instead. Fish says she will find a way to acquire the keys. Fish sneaks into Dr. Dulmacher’s office and grabs the keys. However, Dr. Dulmacher comes in and catches her. She makes excuses, secretly grabbing a knife behind her back. The Dollmaker can tell she’s lying and threatens to shoot her in the stomach if she doesn’t tell the truth. This threat causes Fish to reveal the knife. He assumes she was going to use the knife to kill him, but she insists she was going to use it on herself. She can no longer tolerate the nightmares, she says, which have plagued her since she saw some of the Dollmaker’s creations. He tells her he will make her into one of those creations — resurrecting her from the dead if he has to — if she ever tries anything like this again. Fish opens the outside door for her gang of prisoners, tells them the gate is open and the boat is waiting, and then goes off to get Kelly. But when the prisoners reach the gate, they find it is still locked. It turns out Fish tricked them and only wanted to use them as a distraction for the Catcher. As the Catcher shoots the small band of men, Fish helps Kelly and the other prisoners escape. Dr. Dulmacher appears and attempts to stop Fish, but the other prisoners beat him until Fish gestures for them to follow her to the chopper. The Catcher hears the chopper taking off and rushes to stop it. By the time he gets there, it's already in the air. But he fires some shots, one of which hits Fish in the abdomen. Gritting her teeth, she continues flying her and the others to safety. At Wayne Manor, Jim comes to try to get more information out of Bruce concerning the stabbing from two episodes ago. Bruce, who acts extremely nervous and refuses to meet his gaze, insists he didn’t lie. Jim gives up on getting anything more out of the boy and leaves. Later, while Alfred is supposed to be resting, he instead announces he is leaving to go look for Reggie in the shooting galleries. Bruce tries to stop him, when suddenly Alfred begins bleeding again and is forced to lie down to rest. Bruce decides to use the shooting galleries tip to his advantage and makes a list of local gun ranges. When none of them check out, he goes to Cat for help. She tells him that a gun range is much different from a shooting gallery, which instead refers to a place for heroin users. They go to a shooting gallery Cat knows, where they find Reggie asleep on the floor. The children wake him and demand to know who sent him to stab Alfred. He asks them if Alfred is alright, but they won’t tell him. Instead, they continue to demand to know who sent him, as he refuses to say. Cat steals his bag of drugs and threatens to throw them out the window if he doesn’t cooperate. Reggie gives in and tells the children the name of the person who sent him — Bunderslaw — and that the purpose of sending him was to discover how much Bruce’s investigations had turned up. Bruce orders Cat to give Reggie his bag back, but instead she throws it out the window. Reggie gets extremely angry and threatens to tell on them to Bunderslaw. He sees the bag has actually fallen onto a ledge, and leans out the window to grab it. In order to stop him from telling on them, Bruce considers pushing him out the window, but ultimately can’t go through with it. Cat, however, does not feel the same qualms Bruce does, and pushes Reggie out the window to his death. Bruce stares in horror at Cat and at the dead body lying below. Overall, I thought this was a great episode, and completely worth the wait after the long hiatus. In fact, I would even go so far as to say it’s one of my favorites. I think this is really the first time we’ve seen Cat go full Catwoman mode. She’s always done her fair share of lying and stealing, but no more than any other common street thief. Intentional and calculated murder is new for her — at least, on screen. I think it was also a great way to reflect the future relationship between Batman and Catwoman, who are both extremely similar to one another, but ultimately separated by their views on whether or not it’s okay to kill. I also really love how much Fish seems to like Kelly. Is he useful to her plans somehow, or does she really just care about him that much? But of course, my favorite moment in the episode was when Oswald passed Bruce on the street without either of them knowing it, and then seemed to sense something. It looks like next episode, Eddie makes his descent into his Riddler persona and kills a man for the first time. From what I’ve read, it appears his motivation is defending Kristen in some way. It is also very likely that Oswald’s mother Gertrud will be murdered in the next episode. But who will do the killing? There are multiple possibilities. There’s the theory I came up with a few weeks ago about it possibly being Jim. There’s Fish, who just escaped the island, and will probably be looking for vengeance against Oswald very soon. And then there’s Maroni. Maroni is also a very likely suspect, as Oswald seems right on the verge of making a move against him. If anything goes sour, his mother could end up taking the fall instead. Or perhaps Oswald will use the favor Jim owes him to try to keep Maroni away from his mother, but it backfires. Of course, if we want to know for sure, we’ll have to wait for the next episode! Remember to catch the next episode of Gotham on Monday, April 20th, on Fox.